Formed in early 1960s as a militia group devoted to bring down Pahlavi’s regime, Mojahedin Khalq Organization MKO/MEK/PMOI/NCR boasted of two hallmarks in its ideological infrastructure; being an armed group dedicated to a strategy of armed warfare, and having the reputation for being a tough and uncompromising enemy of imperialism and capitalism. The only way, they resolved, to combat imperialism and its agents was to resort to the armed struggle and appeal to the religious sentiments of the masses. 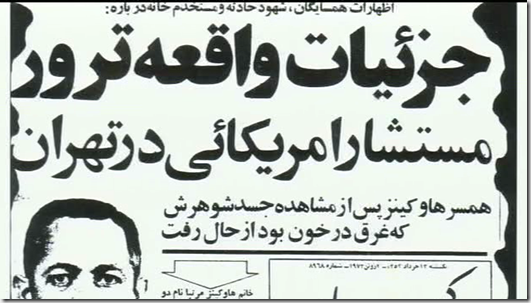 MKO leaders were unanimous on a strategy of denouncing imperialism and capitalism, believing that the blame and responsibility of most of Iran’s contemporary problems could be put on capitalism and imperialism and America at the top. 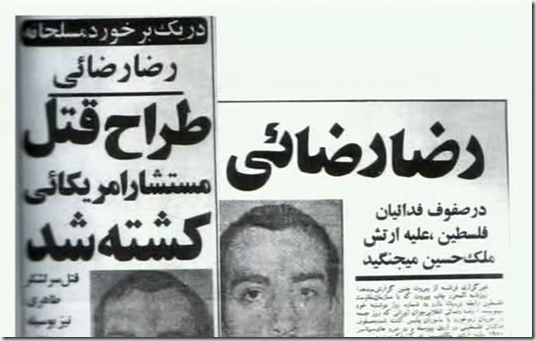 MKO declared to be the revolutionary vanguards of combating against Pahlavi’s monarch as a proxy of American imperialism, a campaign that led majority of the organization’s leading cadres to Shah’s gallows. Furthermore, they boasted of being the sole militant and revolutionary group that dared among many to perpetrate armed operations against American military personnel and interests inside Iran. A random probe into the group’s early papers and publications well demonstrates the extent of its animosity against the US-led policies inside Iran and the perpetrated violence as countermeasures against them. The core of MEK’s ideology has always been anti-imperialism which it has historically defined as opposition to U.S. interests. The MEK opposed the Shah partly because of his close associations with the United States. MEK’s anti-American compulsions propelled it toward embracing an entire spectrum of radical forces ranging from the Vietcong to the PLO. Given its mission of liberating the working class and expunging the influence of predatory capitalism, the United States has traditionally been identified as a source of exploitation and injustice in MEK literature. As the organization has lost it s Iraqi patron and finds itself without any reliable allies, it has somehow modulated its language and sought to moderate its anti-American tone. Such convenient posturing should not distract attention from its well-honed ideological animus to the United States. Terror has always been a hallmark of MEK’s strategy for assuming power. Through much of its past, the party exulted violence as a heroic expression of legitimate dissent. One of the central precepts of the party is that a highly-dedicated group of militants could spark a mass revolution by bravely confronting superior power of the state and assaulting its authority. Once, the masses observe that the state is vulnerable to violence, than they will shed their inhibitions and join the protest, thus sparking the larger revolution. Thus, the most suitable means of affecting political change is necessarily violence. Although in its advocacy in Western capitals, the MKE emphasizes its commitment to democracy and free expression, in neither deed nor word has it forsworn it violent pedigree. During the 1970s, at the height of its revolutionary ardor, the MEK was fairly indiscriminate about its targets of violence. Among the victims of MEK terror have been American installations and military personnel. The MEK’s Communiqué Number 3 stressed that violence against the United States was permissible given America’s suppression of legitimate revolutionary movements in Palestine and Vietnam. The first such attack came in May 1972 on the occasion of President Richard Nixon’s visit to Iran. To derail that visit, the MEK bombed the U.S Information Office and targeted American companies such as General Motors and Pan-American airways. That same year, the party attempted to assassinate General Harold Price, the Chief of U.S Military Mission in Iran. Although General Price escaped his assassins, the MEK did tragically succeed in murdering Colonel Lewis Hawkins, the Deputy Chief of Military Mission outside his house. The French diplomatic genius Charles Maurice de Talleyrand once said: "It was worse than a crime; it was a mistake." This is perhaps the best way to describe the US State Department's recent decision to take the Mujahadeen-e-Khalq (MEK) off its notorious list of 52 foreign terrorist organizations. It was yet another setback in the negotiations between Iran and the West on the former's nuclear program. economy, while Tehran is relentlessly pushing the boundaries of its nuclear-enrichment capabilities toward a fait accompli. Both sides are in essence locked in a precarious form of brinkmanship, bringing the world closer to a devastating confrontation. The Persian Gulf has been witnessing increased military tensions in recent months, with both the US and Iran fortifying their military presence and stepping up their military activities. Meanwhile, sanctions have been biting into Iran's increasingly vulnerable economy, embittering the Iranian population toward the West, especially the US. Instead of reaching out to the Iranian people, as he repeatedly promised, US President Barack Obama is not only imposing what can be termed in international law as collective punishment, but also accommodating an organization that most Iranians identify with treachery and deceit. Obviously, the current deadlock could only be broken through sustained and meaningful diplomacy. However, diplomatic efforts have been in a protracted state of hiatus, with the Iranians postponing any major agreement until the US overcomes its cyclical diplomatic handicap - the inability to make a decisive and lasting concession until the conclusion of the presidential election. The MEK decision is also a classic example of how domestic politics can derail high-stake diplomacy, with the fate of international security hanging in the balance. To secure his re-election bid, President Obama is trying hard to look tough on Iran. But what Obama ignores is how his short-term political calculations may carry long-term risks vis-a-vis the Iranian nuclear issue. The delisting of the MEK came ahead of a court-ordered October deadline, with US Secretary of State Hillary Rodham Clinton sending a classified document to Congress earlier, detailing her department's position on the matter. In 1997, the State Department placed the MEK on its Foreign Terrorist Organizations List for its history of terrorist activities, especially against US citizens in the 1970s. However, ironically, Washington protected the MEK members in Iraq's Camp Ashraf after toppling Saddam Hussein, the organization's main patron. Later, when the group came under increasing pressure - ahead of US troop withdrawal - by the Tehran-backed government in Baghdad, Washington opposed any violent crackdown on the camp, while exploring means to transfer MEK members elsewhere. Finally, amid a logistical headache and rising political noise, Washington transferred some of the 3,000-strong MEK militia to Camp Liberty, a former US military base near Baghdad International Airport. The State Department justified its delisting of the MEK on the grounds that the organization has publicly renounced violence, cooperated in the closure of Camp Ashraf, and has shunned terrorism for more than a decade. Crucially, the move came in the midst of continuous vilification of Iran as an imminent nuclear threat that should be met with force, a narrative enthusiastically espoused by a wide spectrum ranging from hawkish Republicans in the US Congress to pundits in the mainstream media as well as Israeli Prime Minister Benjamin Netanyahu (and his powerful friends in the Israel lobby in the US). Netanyahu has already called for an explicit "red line" against Iran's nuclear program, coaxing Washington to place the military option squarely on the table. However, it is not clear whether Washington actually sees the MEK as a possible asset and a viable ally in the event of direct confrontation with Iran as the window for a diplomatic compromise rapidly narrows. The delisting was perhaps just an effort to annoy Tehran or, more important, to appease the anti-Iran establishment amid the current US presidential election campaign. For its proponents, the recent move was just a logical extension of a broader Western accommodation of an organization that claims to represent the "legitimate democratic opposition" in Iran. Britain delisted the MEK back in 2008 and the European Union a year later. The group has significant presence in such places as Paris, which hosts its headquarters, and has staged major rallies in the French capital. Maryam Rajavi, the organization's Paris-based leader, welcomed the US move by stating: "This has been the correct decision, albeit long overdue, in order to remove a major obstacle in the path of the Iranian people's efforts for democracy." Anti-Iran hawks in the US hardly held back their enthusiasm. Republican Representative Dana Rohrabacher expressed his joy with the decision, because he believes "the MEK are Iranians who desire a secular, peaceful and democratic government", while Ted Poe, Republican member of the House of Representatives Foreign Affairs Committee, described the decision as "long overdue". The decision is a culmination of years of lavish and aggressive lobbying by the MEK - boosted by growing support from rich Iranian-American exiles opposed to the regime in Tehran - directed at (current and former) top US officials and leaders from both the Democratic and Republican camps. The MEK spent US$1.5 million alone to hire three leading Washington lobby firms. It channeled millions of dollars in "speaking fees" to sympathetic American officials and leaders who graced the MEK's high-profile events, rallies and campaign gatherings calling for the State Department to delist the organization. The list of top-notch supporters is astonishing. The former Democratic governor of Pennsylvania, Ed Rendell, has been among the group's biggest beneficiaries, reportedly receiving up to $150,000 in speaking fees. For the Republican chairwoman of the House Committee on Foreign Affairs, Ileana Ros-Lehtinen, the figure stands at around $20,000. Former presidential candidates from both the Republican and Democratic parties, namely Bill Richardson, Howard Dean and Rudolf Giuliani, have also joined the fray. With the speaking-engagement fees running in the territory of $15,000-$30,000, former top security/intelligence officials, namely ex-Federal Bureau of Investigation director Louis Freeh, former Central Intelligence Agency directors Porter Goss and James Woolsey, and Obama's former national security adviser General James Jones, have lent their support too. Even Wesley Clark, a former North Atlantic Treaty Organization commander, is among the elite supporters. What is clear is that the Obama administration has found it increasingly difficult to ignore an organization that has astutely exploited growing cynicism against Iran, staged numerous rallies and vigils outside the State Department, organized huge sit-ins in congressional hearings, and rallied the support of leading US figures. The administration has finally succumbed to the pressure. But this domestic concession could carry significant costs in the broader multilateral efforts to resolve the Iranian nuclear conundrum. In the initial years of the Islamic Revolution, its supporters had to contend with the MEK, an organization founded on an eclectic Marxist-Islamist-nationalist ideology, as a major rival in determining the fate of the new Islamic Republic. After all, during the 1979 revolution, the MEK was among the major players within the broad coalition of forces that deposed the Shah. After a series of violent confrontations in the immediate post-revolutionary years, a severely weakened MEK lost whatever measure of popular legitimacy it enjoyed when it sided with Saddam Hussein against Iran during the eight-year "imposed war" (Jang-e-Tahmili). 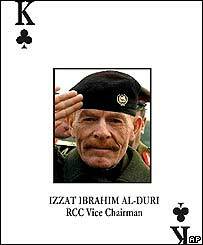 After its expulsion from Iran, much of its paramilitary capability was concentrated in Iraq, under the generous sponsorship of the Baathist regime. So it practically lost any significant presence within Iran. The MEK is an organization with few to no roots within Iran's political landscape, so it is not clear how it could play a critical role in changing that landscape and/or Tehran's nuclear posture to America's advantage. This is precisely why successive US administrations have instead reached out to reformist elements within Iran, never seeing the MEK as a viable ally. It must be noted that Washington's 1997 decision to include the MEK in the list of terrorist organizations was part of its nascent diplomatic outreach to the newly empowered reformist government in Tehran under president Mohammad Khatami. After all, inclusion of groups in the Foreign Terrorist Organization list has been generally arbitrary, simply tuned to America's short-term strategic interests. In recent years the Obama administration, at least rhetorically, sided with Iran's so-called Green Movement - a loose network of forces composed of certain reformist leaders and disenchanted sections of the society - that formed the backbone of post-election protests in 2009. However, there have never been institutionalized channels of communication between Washington and Iran's leading reformists. So it seems that accommodating the MEK is somehow a desperate effort to build ties with alternative Iranian elements explicitly opposed to the regime. Yet there may have been even more concrete reasons. Reports suggesting increased intelligence and security cooperation between the MEK on the one hand and Israeli and US agencies on the other in recent years provide the strongest hint behind Washington's decision to delist the group. In 2002, an MEK-affiliate group, the National Council of Resistance in Iran, revealed a laptop containing confidential information about Iran's burgeoning enrichment activities in Natanz and Arak. Since the MEK does not possess an independent and credible intelligence-gathering capacity, it is widely believed that Israeli intelligence agencies were behind the leaked documents. The revelation marked the beginning of a decade of tense nuclear negotiations between Iran and world powers, which precipitated a severe set of sanctions and repeated threats of military intervention against Tehran. In April this year, leading investigative journalist Seymour Hersh reported that back in 2005, the Nevada-based Joint Special Operations Command trained "Iranians associated with the MEK" as part of the George W Bush administration's broader "global war on terror". Commentators have also suggested that various Western intelligence agencies, especially Israel's Mossad, have been working closely with the MEK in a "shadow war" ranging from sabotage against Iran's key military and oil facilities to the assassination of Iranian nuclear scientists and sabotage of nuclear installations. Understandably, the Iranian authorities immediately lashed out against Washington's decision to delist one of its most long-standing nemeses. Iran holds the MEK responsible for at least 12,000 deaths, including high-profile members of the regime in the early years of the revolution. Iranian state television accused the US of double standards by supporting "good terrorists" who serve its interests by working against Iran and its nuclear program. The Iranian Foreign Ministry warned that the decision would put on the US "responsibility for past, present and future terrorist operations by this group", just as Rajavi expressed her hopes that the delisting "will lead to the expansion of anti-regime activities within Iran". Negotiations on the nuclear program are already in bad shape. Despite repeated overtures by Tehran - from decreasing enrichment activities to the 3-5% territory, to shipping out its stockpile of high-enriched uranium, and opening up of its whole nuclear infrastructure for inspection - to resolve the standoff, the Obama administration has repeatedly refused to meet Iran's two basic demands: (1) An unequivocal recognition of Iran's enrichment rights under the Non-Proliferation Treaty (NPT); and (2) reversal of unilateral sanctions battering Iran's entire economy. Obama's accommodation of the MEK will further undermine its nuclear diplomacy toward Iran. It will do nothing but strengthen the hands of Iranian hardliners - at the expense of pro-diplomacy pragmatists - who have called for a withdrawal from the NPT, an increase of enrichment levels to 60%, and preparations for a military confrontation with the West. Beyond regime insiders, the Obama administration has also alienated ordinary Iranians and opposition elements who detest the MEK and view the latest move as another cynical ploy to retard Iran's scientific progress and bring the country to its knees. Richard Javad Heydarian is a Manila-based foreign-affairs analyst. He has reported for or been quoted in The Diplomat, UPI, Foreign Policy, Tehran Times, Russia Today and Foreign Policy In Focus, among others. The anonymous Israeli intelligence official's claim, cited in the committee report, that the "blueprints" in the "alleged studies" collection matched documents his agency had gotten from its own source seems to confirm the analyst's finding that Israeli intelligence assembled the documents. German officials have said that the Mujahedin E Khalq (MEK), the Iranian resistance organization, brought the laptop documents collection to the attention of US intelligence, as reported by IPS in February 2008. Israeli ties with the political arm of the MEK, the National Committee of Resistance in Iran (NCRI), go back to the early 1990s and include assistance to the organization in broadcasting into Iran from Paris. The NCRI publicly revealed the existence of the Natanz uranium-enrichment facility in August 2002. However, that and other intelligence apparently came from Israeli intelligence. The Israeli co-authors of The Nuclear Sphinx of Tehran, Yossi Melman and Meir Javeanfar, revealed that "Western" intelligence was "laundered" to hide its actual provenance by providing it to Iranian opposition groups, especially NCRI, in order to get it to the IAEA. They cite US, British and Israeli officials as sources for the revelation. New Yorker writer Connie Bruck wrote in a March 2006 article that an Israeli diplomat confirmed to her that Israel had found the MEK "useful" but declined to elaborate. WASHINGTON - A report on Iran's nuclear program issued by the United States Senate Foreign Relations Committee last month generated news stories publicizing an incendiary charge that US intelligence is underestimating Iran's progress in designing a "nuclear warhead" before the halt in nuclear weapons-related research in 2003. That false and misleading charge from an intelligence official of a foreign country, who was not identified but was clearly Israeli, reinforces two of Israel's key themes on Iran - that the 2007 US National Intelligence Estimate (NIE) on Iran is wrong, and that Tehran is poised to build nuclear weapons as soon as possible. But it also provides new evidence that Israeli intelligence was the source of the collection of intelligence documents which have been used to accuse Iran of hiding nuclear weapons research. The committee report, dated May 4, cited unnamed "foreign analysts" as claiming intelligence that Iran ended its nuclear weapons-related work in 2003 because it had mastered the design and tested components of a nuclear weapon and thus didn't need to work on it further until it had produced enough sufficient material. That conclusion, which implies that Iran has already decided to build nuclear weapons, contradicts both the 2007 NIE on Iran, and current intelligence analysis. The NIE concluded that Iran had ended nuclear weapons-related work in 2003 because of increased international scrutiny, and that it was "less determined to develop nuclear weapons than we have been judging since 2005". The report included what appears to be a spectacular revelation from "a senior allied intelligence official" that a collection of intelligence documents supposedly obtained by US intelligence in 2004 from an Iranian laptop computer included "blueprints for a nuclear warhead". It quotes the unnamed official as saying that the blueprints "precisely matched" similar blueprints the official's own agency "had obtained from other sources inside Iran". No US or International Atomic Energy Agency (IAEA) official have ever claimed that the so-called laptop documents included designs for a "nuclear warhead". The detailed list in a May 26, 2008, IAEA report of the contents of what have been called the "alleged studies" - intelligence documents on alleged Iranian nuclear weapons work - made no mention of any such blueprints. In using the phrase "blueprints for a nuclear warhead", the unnamed official was evidently seeking to conflate blueprints for the re-entry vehicle of the Iranian Shehab missile, which were among the alleged Iranian documents, with blueprints for nuclear weapons. When New York Times reporters William J Broad and David E Sanger used the term "nuclear warhead" to refer to a re-entry vehicle in a November 13, 2005, story on the intelligence documents on the Iranian nuclear program, it brought sharp criticism from David Albright, the president of the Institute for Science and International Security. "This distinction is not minor," Albright observed, "and Broad should understand the differences between the two objects, particularly when the information does not contain any words such as nuclear or nuclear warhead." The Senate report does not identify the country for which the analyst in question works, and the Senate Foreign Relations Committee staff refused to respond to questions about the report from Inter Press Service (IPS), including the reason why the report concealed the identity of the country for which the unidentified "senior allied intelligence official" works. Reached later in May, the author of the report, Douglas Frantz, said he was under strict instructions not to speak with the news media. After a briefing on the report for selected news media immediately after its release, however, the Associated Press reported May 6 that interviews were conducted in Israel. Frantz was apparently forbidden by Israeli officials from revealing their national affiliation as a condition for the interviews. Frantz, a former journalist for the Los Angeles Times, had extensive contacts with high-ranking Israeli military, intelligence and Foreign Ministry officials before joining the Senate Foreign Relations Committee staff. 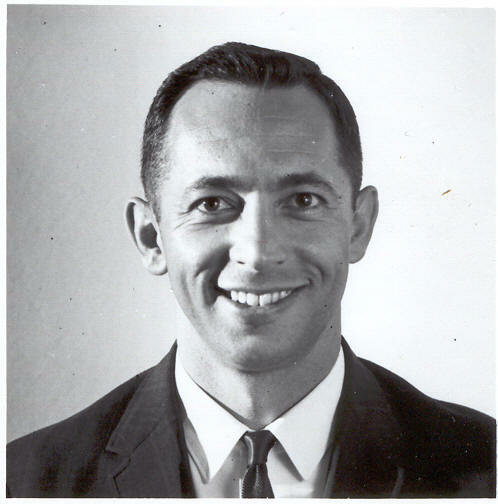 He and co-author Catherine Collins conducted interviews with those Israeli officials for The Nuclear Jihadist, published in 2007. The interviews were all conducted under rules prohibiting disclosure of their identities, according to the book. The unnamed Israeli intelligence officer's statement that the "blueprints for a nuclear warhead" - meaning specifications for a missile re-entry vehicle - were identical to "designs his agency had obtained from other sources in Iran" suggests that the documents collection which the IAEA has called "alleged studies" actually originated in Israel. A US-based nuclear weapons analyst who has followed the "alleged studies" intelligence documents closely says he understands that the documents obtained by US intelligence in 2004 were not originally stored on the laptop on which they were located when they were brought in by an unidentified Iranian source, as US officials have claimed to US journalists. The analyst, who insists on not being identified, says the documents were collected by an intelligence network and then assembled on a single laptop. Israeli intelligence is also known to have been actively seeking to use alleged Iranian documents to prove that Iran had an active nuclear weapons program just at the time the intelligence documents which eventually surfaced in 2004 would have been put together. The most revealing glimpse of Israeli use of such documents to influence international opinion on Iran's nuclear program comes from the book by Frantz and Collins. They report that Israel's international intelligence agency Mossad created a special unit in the summer of 2003 to carry out a campaign to provide secret briefings on the Iranian nuclear program, which sometimes included "documents from inside Iran and elsewhere". The "alleged studies" collection of documents has never been verified as genuine by either the IAEA or by intelligence analysts. The Senate report said senior United Nations officials and foreign intelligence officials who had seen "many of the documents" in the collection of alleged Iranian military documents had told committee staff "it is impossible to rule out an elaborate intelligence ruse". The rally by the PMOI, which Washington considers to be a terrorist organisation, was attended by former US ambassador to the United Nations John Bolton and Jose Maria Aznar, the former prime minister of Spain. Bolton and Aznar were there to represent a transatlantic coalition of neoconservative pro-Israeli interests who seem to wish to promote the PMOI as the legitimate opposition to Iran's clerical regime. Bolton’s credentials need no rehearsal here, but let’s not forget that Aznar has recently signed on as a founding member of a European Friends of Israel, in the face of the disastrous repercussions of the Gaza Freedom floatilla raid. The reason for this is fairly clear: on the issues of Israel and on Iran's nuclear program the Green Movement is dedicated to promoting an independent policy for the country. While it is likely they would take a very different tone and approach to both issues, the Green Movement will likely do little to satisfy the interests of the Israel Lobby and neoconservatives for a pro-Israeli and subservient Iran. With the PMOI as the only reasonably well-established alternative, these groups have thrown their lot in with them. If the confrontation with Iran becomes military in nature, it seems likely that the PMOI will be (again) touted by these interests as the “leadership in exile” for any regime-change scenario. This is not entirely new. During the Bush years, the PMOI sought alliances with the neoconservatives in the US, with a number of bipartisan congressmen acting as intermediaries to call for their removal from the terrorist list, and to advocate for their recognition as a legitimate Iranian opposition group. They are now at it again, with a new move to give legitimacy to the group launched just days ago, with a number of congressmen signed on. In the past, highly-placed neoconservatives such as Richard Perle have attended PMOI-related events and spoke positively of the group. And the group has done much to complement the interests of these allies: they were instrumental in building up the case for Iran's nuclear program, and have supplied intelligence they claim to have gathered from inside Iran to bolster the case for an arms program -- it's unclear how accurate or legitimate this intelligence may be, but there are certainly shades of the famous WMD intelligence relating to Iraq in all of this. Among most prominent activists in the Iranian opposition, the PMOI is rarely remembered kindly, when they are bothered to be remembered at all. 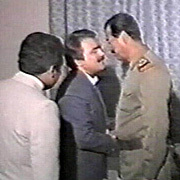 Already discredited among most Iranians for their alliance with Saddam Hussein during the Iran-Iraq war, and despised by Kurds everywhere for willfully participating in Hussein's genocidal campaigns against them, the Mojahedin have come to be seen by most Iranians as an embarrassing aberration in the political landscape. While the Islamic Republic has a virulent hostility towards the group, most secular left or reformist Iranians also will have nothing to do with the group and reject its inclusion in any coalitions to oppose the regime. In Europe and the US, during anti-regime demonstrations supporting the Green Movement, the appearance of PMOI flags or leaflets often led to standoffs and even fights among the demonstrators, with PMOI agents far outnumbered. They now stand all alone in the Iranian scene, with their only true supporters drawn from the Israel Lobby and the margins of US and European politics. What is so strange is that there they had once acted as the vanguard of revolutionary activity and as a synthesis of leftist and Islamist idealism in the first years of the post-revolutionary period. However, in exile they have been transformed into a political irrelevancy, made worse by their adoption of cult-like policies to maintain discipline in their ranks. The group demands of the rank-and-file a troubling adoration of the figure of Maryam Rajavi, the nominal leader of the group, relying on systems of regular debriefing and self-criticism which are mandatory for all members. Furthermore the group exerts control of many aspects of members' personal lives, including in matters of marriage, divorce and parenting. Given what they have become, any idea of their resurgence as a valid player in Iranian politics strikes me as one of the most terrifying possibilities for Iran's future. Their placement on the US terrorism list was clearly a political gesture during Clinton's administration, but many Iranians find them more troubling for reasons other than the terrorist acts they have carried out. Bizarrely, the PMOI continues to enjoy support even among some on the US left. The Huffington Post, for example, offers a forum to two of the group’s more active US propagandists, Ali Safavi and Alireza Jafarzadeh. It seems likely that we’ll be hearing more about them once again as the talk of a military confrontation grows. It’s no surprise that the neocons and Israel’s most steadfast supporters are also now openly backing the PMOI. On 26 June 2010, the People’s Mujahedin of Iran (Mujahideen-e-Khalq) convened a gathering of their members at Taverney, near Paris. This military sect is commanded by Massoud and Myriam Rajavi, although it is not known whether Massoud is still alive since he hasn’t been seen in public since 2003. While the Pentagon and the Obama Administration have detached themselves from this organisation, the Mujahedin continue to enjoy the support of the neo-conservatives, Israel and France, which hosts its headquarters. Approximately 30 000 people from all over Europe listened to speeches by former Spanish Prime Minister José-Maria Aznar and former U.S. Ambassador to the United Nations John Bolton - who recently joined forces to found the Friends of Israel Initiative- calling on the State Department to stop considering the People’s Mujahedin as a terrorist organisation and on the European Union to unilaterally reinforce the sanctions against Iran. Ayad Allawi is being dragged into a controversy created by Western Baathist supporters. Struan Stevenson MEP, Chair of the European Parliament’s Iraq Delegation has said he has received many letters claiming that widespread fraud had taken place in the Iraqi election on March 7. Struan Stevenson is a strong advocate of the Washington/Zionist backed foreign terrorist group, Mojahedin-e Khalq(MKO) which continues with its illegal presence in Iraq. The Government of Iraq had charged that the MKO have been actively interfering in Iraqi affairs over the past six years. The MKO base Camp Ashraf (now Camp New Iraq) was used as a covert meeting place for Saddamists. The MKO also has some of its members working in the European Parliament. Mass letter writing and scaremongering accusations without evidence are typical MKO tactics. Before the election, former Iraqi MP Saleh al-Mutlaq was barred from standing for election because of his association with the MKO – he channelled funds for the terrorist organisation. 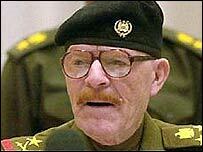 Now, after the election, Struan Stevenson has claimed “Major efforts are exercised to deny the win of former Prime Minister Iyad Allawi”. It looks as though Mr Allawi is also being tarnished by association with supporters of the former Saddam regime.